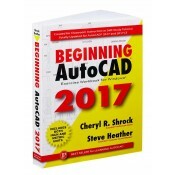 Beginning AutoCAD ® 2017 Exercise Workbook Sale! For new users of AutoCAD®, or those simply brushing up on their skills, there is no better resource. Beginning AutoCAD® 2017 Exercise Workbook by Cheryl Shrock and Steve Heather provides step-by-step instructions with corresponding screen shots illustrating exactly what the user will see when using the software. All of the new bells and whistles of AutoCAD 2017 are featured. For instance, users can now directly import a .PDF drawing, including both the geometry and text, into drawing entities that can be modified within AutoCAD. New function that allows users to convert an imported .pdf drawing, which can then be modified and customized in AutoCAD as usable geometry. Dialog Box enhancements that enable custom resizing of many of the dialog boxes. Share Design View command, which lets users publish views of drawings to the Cloud and share them with others, while still protecting the original drawing files. Autodesk Home, a companion application delivering updates and patches to AutoCAD software. For the first time, this top-selling Workbook and the companion title Advanced AutoCAD® 2017 Exercise Workbook now include both METRIC and INCH measurements side by side, so that readers worldwide can benefit from all of the instructions and exercises. The best-selling title, which has been helping AutoCAD users for more than two decades, is better than ever! Notify me of updates to Beginning AutoCAD ® 2017 Exercise Workbook Sale!